Engraved with nearly 30,000 names, the Monument to Memory and Truth is a roll of dead and disappeared from the conflict, which ended in 1992. It is incomplete. Officially, the fighting between leftist guerrillas and the right-wing military government killed 75,000 and left thousands more missing. Not all the names of the war's victims were available when the monument project began, so the list is growing. The monument, erected five years ago by the city's leftist-run government, draws visitors from around the country to mourn loved ones confirmed killed in the political violence or, in many cases, who have simply vanished. An engraved name on this glinting stone is often the closest thing to a proper grave site many people will have. 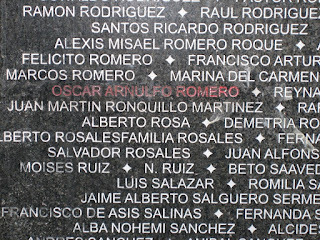 The neat rows of names represent bits of history, fibers of memory, personal anguish. 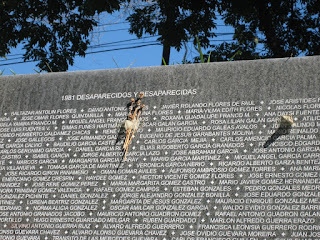 Like the monument at El Mozote, the recording of the names of innocent victims provides a powerful reminder of a history which must not be repeated. Readers may also want to read this blog post written by a surfer who decides to walk from the MetroCentro shopping mall to Cuscatlan Park in the city's center. I went to look at the monument last year. I wasn't completely sure where it was (and it hardly stands out even when you're close by). So I had to ask people on the street. What somewhat shocked me was that nobody seemed to know of its existence. How different would our country be if the marxist guerrillas had not started kidnapping, torturing, and killing innocent civilians in February 1971? 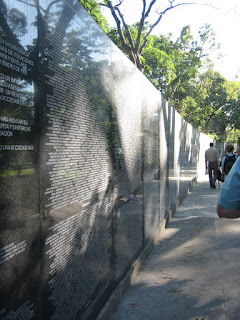 How heavily these 30,000 names must weigh on the souls of the marxist killers and torturers who started the war. 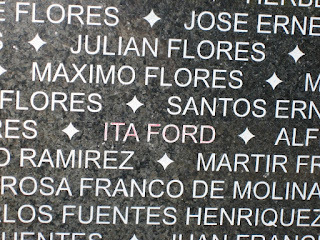 The names carved in the monument are from the other victims, the ones killed by the government, who started massacring its own citizens (and foreingners like American Ita Ford killed in 1980) as far as 1833. Marvin Galeas was a Communist guerrillero throughout the 1980's. The guy dodged government bullets and bombs for over a decade. He was one of the leaders of Marxist Radio Venceremos. David Escobar Galindo's resumé as a peace negotiator and man of impeccable impartiality cannot be even questioned. The man is beyond dispute one of the most respected intellectuals of El Salvador, if not the most respected. Lady, don't get your ignorance get ahead of yourself.